Suarez jubilant after a strong performance. Suarez returned to England to halt City and score two to take back to Spain as Barcelona took the victory at the Etihad Stadium. Aguero scored one goal but Barca have the one goal advantage to win and plus the away goal over City going to the Etihad in 2 weeks time. An enthusiastic Spanish theme fill the Etihad as these two were at the same point last year, this year when City got knocked out by Barca after two legs of this tie in the UCL. Messi was playing well as Iniesta grabbed the ball, passed to Neymar, back to Messi... Blocked by Demichelis. Kompany put Suarez in, he got caught out, had a shot, missed. Neymar received treatment for about 2 minutes, he was fine and was straight back on. Alves and Messi played tika-taka well, Messi crossed the ball, Suarez couldn't get to a header, he compromised with a volley that crashed past Hart with no doubt. Neymar was in the wars, he got taken out but Zabaleta got the ball. Messi was running and running, Jordi Alba crossed in the ball to Suarez, He ran across the defender, slid and scored. Barca now had 2 away goals. Aguero was on the move got challenged by Pique and Silva took Alves out. Messi was clear, Kompany made a challenge in the box, he got the ball and Rakitic went in rash on Komoany from his challenge on Messi. Rakitic found a yellow card. Alves was in from a rebounded clearance, Alves tried a chip, Hart couldn't reach the ball, it his the crossbar! Lucky for City. Alves took a nibble at Aguero and Alves took the yellow late on. Aguero got the ball out to Nasri, he had a shot, Aguero missed the rebound and the City corner was wasted and that was it for the first half. Both sides needed a well earned break even though the difference was 2 and Barca had the two goals. 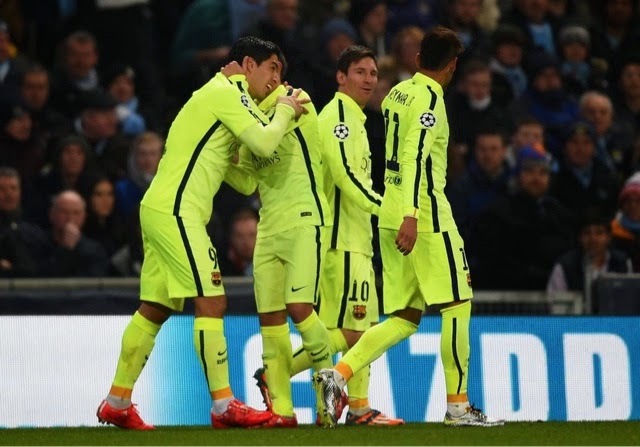 At the Break it was City 0 - 2 Barca, Suarez had both. Barca put on a masterclass. Silva crossed the ball in, Dzeko headed the ball and Ter Stegen saved the attempt. City made chances but couldn't deliver. Sergio Aguero let fly but the ball trickled wide. A free kick got whipped in by Silva, Demichelis headed into Ter Stegen. Clichy made a horror challenge on Rakitic and the Frenchman misses the next game. Samir Nasri gave way for Fernandinho early in the second half. Wilfried Bony was on in his first ever UCL game as he made way for Dzeko, seventy minutes in. As soon as Bony came on he played well and Silva set up Aguero and City had hope. Messi played in a ball, diving header from Suarez, it went wide and it was also offside! Mathieu came on for Rakitic with 20 minutes to go. Fernandinho won the ball abput Bony was greedy, had a shot and missed. Clichy missed the ball and went high on Alves, he got another yellow to get a red card and went off, Alves was off the pitch. Adriano replaced the injured Alves. Zabaleta made another good challenge as Silva made way for Sagna, before this Messi's shot was tipped over by Hart and Barca took a corner and City were on the break but it was wasted terribly. Neymar soon saw Pedro take his place. Messi got yellow for nudging Demichelis over. Messi scored with 3 seconds left of normal time but he was unfortunately offside. 2 minutes later; Messi got taken down in the area by Zabaleta and Messi missed his chance with a Hart save. Still, City 1 - 2 Barcelona. The match ended with a Barca win and City go to Spain a goal behind. City are stunned as Suarez scores two in Manchester. Luis Suarez scores a brace as Barcelona humble Manchester City.